Thoroughly mix the required amount of Horse to Foal 2X with feed ration. Enclosed scoop measures 0.25 pound (4 oz). 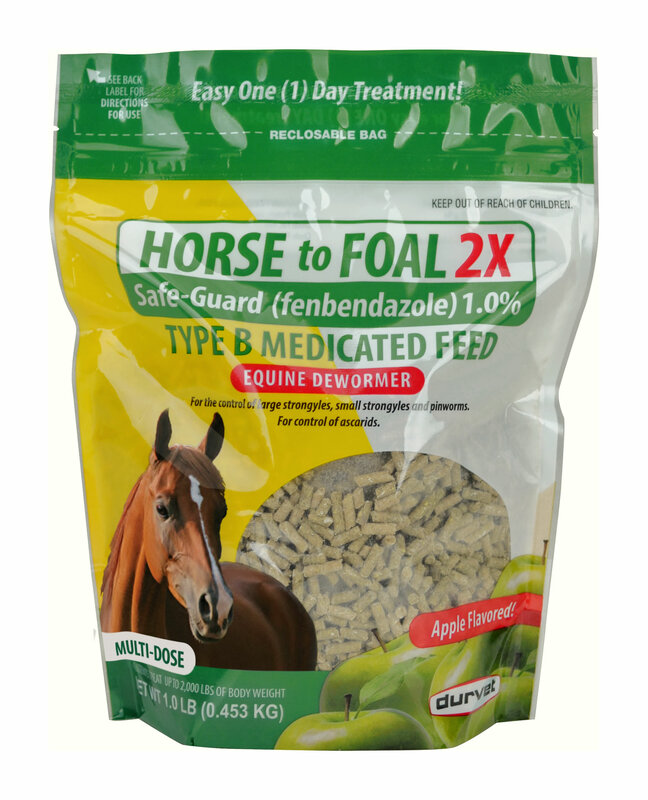 For the control of large strongyles, small strongyles and pinworms, the recommended dose is 5 mg fenbendazole per kg body weight (2.27 mg fenbendazole per pound) in a ONE (1) DAY treatment. Example: a 1,000-lb horse should receive 0.50 pound (8 oz) of Horse to Foal 2X in a ONE (1) DAY treatment. For the control of ascarids, the recommended dose is 10 mg fenbendazole per kg body weight (4.54 mg fenbendazole per pound) in a ONE (1) DAY treatment. Example: a 1,000-lb horse should receive 1.0 pound (16 oz) of Horse to Foal 2X in a ONE (1) DAY treatment. All horses must be eating normally to ensure that each animal consumes an adequate amount of medicated feed. Regular deworming at intervals of 6 to 8 weeks may be required due to the possibility of reinfection. Consult your veterinarian for assistance in the diagnosis, treatment and control of parasitism.